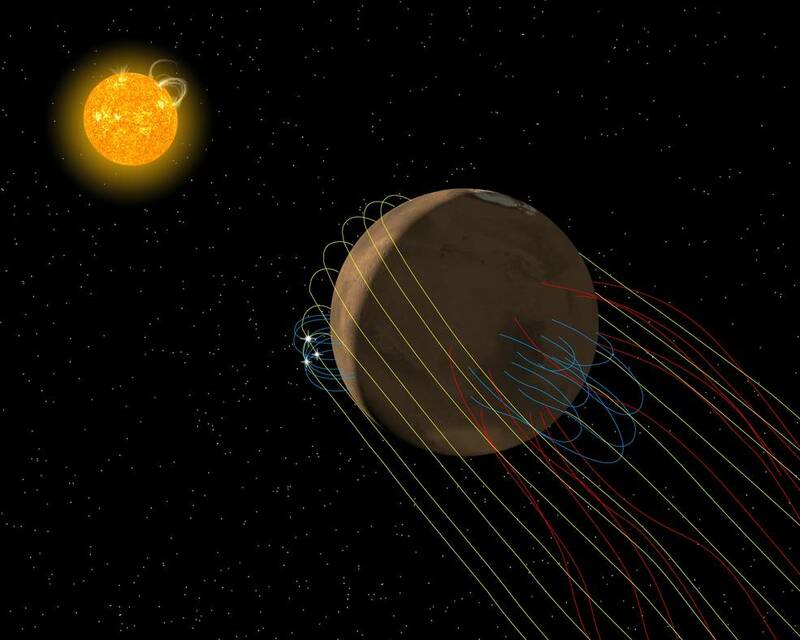 October 19, 2017 – Mars has an invisible magnetic “tail” that is twisted by interaction with the solar wind, according to new research using data from NASA’s MAVEN spacecraft. “We found that Mars’ magnetic tail, or magnetotail, is unique in the solar system,” said Gina DiBraccio of NASA’s Goddard Space Flight Center in Greenbelt, Maryland. “It’s not like the magnetotail found at Venus, a planet with no magnetic field of its own, nor is it like Earth’s, which is surrounded by its own internally generated magnetic field. Instead, it is a hybrid between the two.” DiBraccio is project scientist for MAVEN and presented this research at a press briefing Thursday, October 19 at 12:15pm MDT during the 49th annual meeting of the American Astronomical Society’s Division for Planetary Sciences in Provo, Utah.